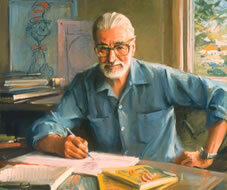 Throughout his life, THEODOR GEISEL ("DR. SEUSS") acted for reasons that were in the broad sense political: condemning isolationism, attacking racism, working for literacy, fighting for the environment, ridiculing the arms race. And yet, few people are aware of this side of Dr. Seuss. Most Americans don't know that during World War II he drew editorial cartoons for the left-wing New York newspaper PM, or that he made army propaganda films with Frank Capra. How many of his readers know that Yertle the Turtle was modeled on Hitler? Or that Horton Hears a Who was a parable about the American postwar occupation of Japan? In fact, his personal favorite from among his many titles was The Lorax, which tried to make a case for environmental awareness. It may be that Dr. Seuss's true genius lies in the fact that it was all done with such humor and finesse that few realized he was even being political. 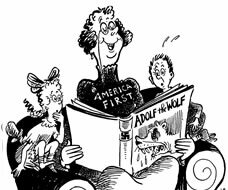 1941 Dr. Seuss PM cartoon ...and the Wolf chewed up the children and spit out their bones...But those were Foreign Children and it really didn't matter. THE POLITICAL DR. SEUSS is a thorough and vivid portrait of this American icon, tracing Geisel's life from his boyhood in Springfield, Massachusetts, to his final days in La Jolla, California. In-depth interviews with his widow Audrey; biographers Judith and Neil Morgan; friends and colleagues at Random House; and several historians—not to mention Dr. Seuss's own words through voice-over—bring the man to life. The film also includes previously unseen material such as illustration drafts, family photographs, and rare television appearances. It explores his little-known World War II era cartoons and film work (Private SNAFU, Your Job in Germany, Design for Death), and examines the many messages found in his children's books (Horton Hears a Who, Yertle the Turtle, The Sneetches, The Cat in the Hat, The Lorax, The Butter Battle Book). What emerges is an intriguing look at this largely unknown side of Dr. Seuss, and one that serves as a lens through which to view 20th-Century American history. Dr. Seuss text, characters, and images ™ & © 1937-1991 Dr. Seuss Enterprises, L.P. All rights reserved.